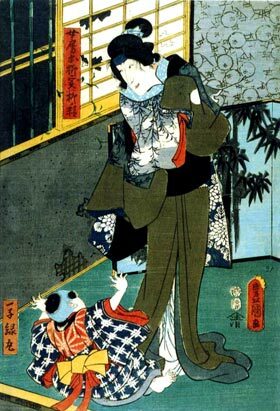 The drama "Gion Nyogo Kokonoe Nishiki" was originally written for the puppet theater (Bunraku) and staged for the first time in the 12th lunar month of 1760 in Ôsaka at the Toyotakeza. This 5-act drama was about the legend of the willow tree that forms the long ridgepole of the hall of the Sanjusangendô Temple in Kyôto. It is famous for the work song that makes the willow tree move at the end. The third act (the best one) became an independent play in the 7th lunar month of 1825, which was entitled "Sanjûsangendô Munagi no Yurai". On the occasion of an imperial hunt, a hunting falcon gets caught in the upper branches of a giant willow tree. They are about to cut down the tree to recover the falcon when a man named Heitarô deftly frees the falcon, rescuing both the bird and the tree. Some years later, Heitarô is living as a simple hunter together with his mother, his wife Oryû and their young son Midorimaru. Meanwhile, in the imperial palace, the retired emperor is suffering great headaches and a fortune teller has revealed that the roots of a willow tree are twisting around the skull of his former incarnation and says that the willow tree should be cut down and used to build a temple. As Heitarô and his family hear the sounds of the tree being cut down, Oryû suddenly collapses in agony. In fact, she is the spirit of the willow tree that has taken human form and become Heitarô’s wife in gratitude for his saving the tree. She says farewell to her husband and son and disappears. As workers are pulling along the cut-down tree, suddenly it stops moving. Heitarô and his son appear and the tree does not move again until little Midorimaru sings a work song. At the sound of his tearful voice, the tree miraculously moves by itself. The name Oryû also means willow tree (the sino-japanese reading of the ideogram used for the word yanagi.